All three Caribbean competitors in the current regional football tournament here—Trinidad, Jamaica and the Dutch Antilles—were beaten by Central American sides last night, leaving them virtually out of the running for the winner's crown. The Jamaican team, which lost 0—3 to Costa Rica in the first round of the Confederation of North-Central and Caribbean tournament (CONCACAF), was last night beaten by Mexico. Trinidad playing their first game here, lost 0—2 to Guatemala, while Costa Rica, at present unbeaten, notched up a 2—1 victory against the Dutch Antilles. Because of rain earlier this week, the round-robin tournament will be played until December 7, with all six competitors playing one another. Tomorrow Guatemala and the Dutch Antilles meet. The Jamaicans, despite looking sharp and playing attractively, could make little impression on the Mexican defence last night and they rarely came near to scoring. After just 15 minutes of the game, Mexico's fast and effective forward Mancilla scored the first goal after a series of dangerous attacks upfield. 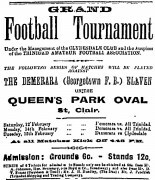 The Jamaicans, never down-hearted by their one-goal disadvantage, rallied after about 20 minutes, but they had no forward who could finish their moves and the Mexican defence withstood each advance. In mid-field, despite the 4,500-foot height of this city, to which the Mexicans should have been more accustomed, the Jamaicans were always swifter than their opponents, reaching the ball first, but often losing possession through poor passing and bad finishing. At half-time the score was 1—0. Soon after the teams switched ends, the Mexicans launched a new offensive, invariably led by Mancilla, which culminated in their second goal, scored by Sabater in the eighteenth minute. After that, the Mexicans seemed on the verge of a third goal until the final whistle. The line-up: JAMAICA: Constantine, Dawkins, Scott, Stewart, Brown, Hamilton, Largie, Cameron, Mason, Kerr and Welch. Hill substituted for Kerr and Simmonds for Brown during the game. MEXICO: Palacios Santana, Rodriquez, Uribe, Muniz, Desales, Urbina, Langarica, Barba, Mancilla and Sabater. Diaz came in for Barba and Crespo for Mancilla. Guatemala, who won the tournament last year, looked confident and efficient in their 2—0 victory over Trinidad and Tobago last night. Guatemala's Gamboa scored after just eight minutes, then the second goal was notched up in the 18th minute of the second half. Trinidad had possession of the ball for long periods in mid-field, but could rarely approach the Guatemalan goal-mouth and their defence looked shaky when the Latin team launched penetrating attacks. But the Trinidadian forward Cummings had several near misses and his efforts were warmly applauded by the crowd. Costa Rica and the Dutch Antilles were drawn 1—1 at half time, after goals by Grant for Costa Rica in the first minute and Croes for the Dutch Antilles after 28 minutes. Costa Rica's Cascante scored the winning goal in the 75th minute, placing the home side, with two victories in two games, as the current tournament leader.